The Cadillac Escalade was all the rage in the early 2000s. Luxury, flare, & utility, the Escalade had it all…but it was one of the worst economic recessions in United States history that caused consumers to scale back and focus harder on the necessities versus the luxuries. In addition, gas prices seemed to skyrocket as turmoil in the middle-east continued. Many Americans sold their gas guzzler SUVs, such as the Cadillac Escalade, and opted for more fuel-efficient vehicles. In that bubble of high-demand for the 1:1 Cadillac Escalade, we saw Hot Wheels release FOUR Escalade models from 2003 to 2004. The ‘Tooned Cadillac Escalade (’03), the Blings Cadillac Escalade (’04), the Cadillac Escalade (’04) and the Cadillac Escalade EXT (’04) shown below. The Cadillac Escalade EXT was the pickup truck version of the Cadillac Escalade SUV. It was first released as part of the Whips line in the New School Team Baurtwell series where it had 3 colorways–Metalflake Brown, Black/Orange & Spectraflame Blue (chase color). The casting was retooled in 2005 where it appeared in the “over-the-top” Rims line featuring its front grill cast as part of the body. For its 3rd release in 2009, the casting was modified once again to have tonneau cover cast as part of the body. 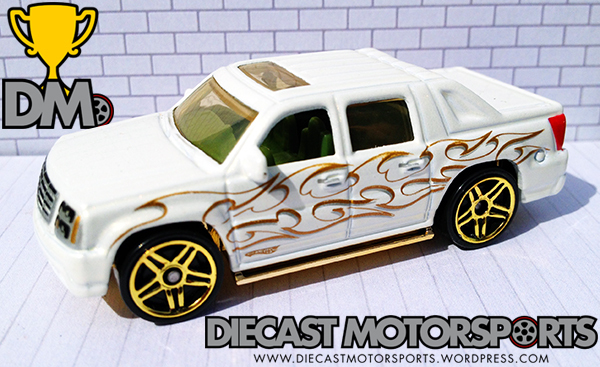 That 3rd release in 2009 was the Holiday Hot Rods seasonal line where the Cadillac Escalade EXT would appear in white (shown below) as a blister card release exclusive to Walmart stores in the United States. The other color, gold, would appear in the Holiday Hot Rods 3-Packs sold exclusively at Target. RELEASE DETAILS: Pearl White Body (metal). Light Gold Tinted Windows. Gray Interior. Gold Chrome PR5 Wheels. Gold Chrome Base (plastic). Made in Thailand. Toy# N8573. Released in 2009 as part of the Holiday Hot Rods sold exclusively at Walmart.